The Duke of Rothesay accepts tapestry from Edinburgh weaver Ben Hymers. 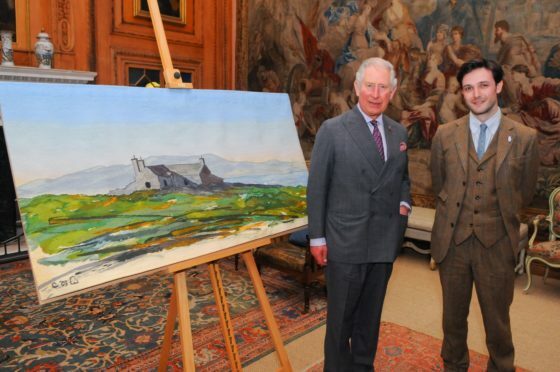 An artist’s colourful tapestry depicting a watercolour landscape painted by the Duke of Rothesay will be hung on the wall of a Highland castle. Ben Hymers spent eight months weaving the creation with colourful yarns after he was loaned the original artwork during his apprenticeship at Dovecot Studios in Edinburgh. The 29-year-old faced the challenge of creating the element of translucence typically seen in the popular painting medium in his tapestry. Hundreds of different yarns were used to bring the Abandoned Cottage on the Isle of Stroma, Caithness artwork to life. The tips of the chimneys of the cottage were even made using undyed natural wool from Welsh Lleynn sheep; the same breed based on the prince’s Highgrove estate in Gloucestershire. Now the artwork will hang on the walls of the Castle of Mey, the prince’s late grandmother’s Highland retreat. Mr Hymers said: “I’m proud that I managed to stick it out. I wanted to represent a watercolour in wool, which was a challenge. “You don’t want a slavish copy of the watercolour, as that’s like translating a novel through an online tool; you don’t capture the essence. “Instead, I wanted to accurately show the techniques used by the prince in a tapestry, to represent the idea of the layers of colour he used and the quick strokes he applied. The artwork has now been presented to the prince at Dumfries House and will soon be transported to the castle. Janet Casey, curator at Dumfries House, said: “The detail and vibrancy of this tapestry is testament to Ben’s skill and diligence in interpreting The Prince’s watercolour painting.